Just kicking off the 5×5 Action Challenge today!! 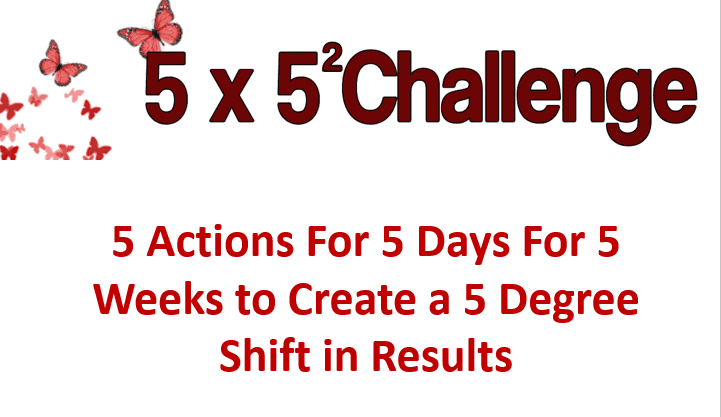 The challenge is five actions for five days for five weeks for a five degrees shift in results!! Day 1, itself was a challenge, due to meetings and commitments. But, here I am working on the five actions for today!! 1. Blog Post — Launch the action plan!! 2. Instagram Post — share image on Instagram, like and share other posts. 3. Facebook Post — share blog post to: Facebook, Instagram, Pinterest and Twitter. 5. Co-Promote — share at least five posts via co-promote. Tomorrow’s plan looks totally different! I will be doing a Periscope LIVE — on Launching Your Dreams — making WILD Ideas Happen. Posting on five social media platforms following the Periscope to share that with people and embedding that live feed onto this site. Yesterday’s webinar — guides you through the planning process — which is simple and flexible. You can jump into the challenge at any point. You can watch what I am doing and do it on your own, or you can join the 5×5 Challenge!! Next week’s webinar will be announced on FRIDAY! So be sure to watch for that too. Click below to join the 5×5 Challenge!! The BIG Goal for the 5×5 Action Challenge is to create new and different results in your business, from where you are right now. Many, many business owners find that they are doing alot but not getting the results they want. What if, instead of continuing on down the same old path, you were to shift the actions each day? Can that shift, even a small shift, change your results. To do the 5×5 Action Challenge — you do not have to spend more money on marketing. Just take consistent, daily ACTION.